We’d love your help. Let us know what’s wrong with this preview of Assassin's Creed by Oliver Bowden. To ask other readers questions about Assassin's Creed, please sign up. Has anyone ever played the games to this i know my hubby has i wonder if this one is coming out as a game for ps4 would love to get it for my hubby :) ? Nick Green Yes, Heather is right. But 'Underworld' covers the events that lead up to Syndicate, and the Book, from halfway onwards, covers that events that…moreYes, Heather is right. As a huge fan of the Assassin's Creed and Victorian London, I HAD to buy this book. After finishing the game a month or so ago, I needed to fill the hole that it had left in my heart. The book is essentially split into three halves, starting before the events of the game and focusing on the character of Henry Green (or Jayadeep Mir/The Ghost/Bharat Singh) and how he became an Assassin. It later focuses on the Frye twins and follows the story of the game exactly. As much as I love the game, it took me a month to read this because it just didn't hold my attention. I really liked learning more about Henry, his background and how he came to London, however I found it quite tedious to read at times. The story definitely picked up around half-way through and then I fully got engrossed in it when it focused upon Evie, Jacob and the storyline of Syndicate. My favourite part of the book was absolutely the ending. I love that we are shown the developing relationship between Henry and Evie, something that was suggested but slightly glossed over in the game. When I first got this title my initial exited was tempered by the fact I'd not before seen such a mess of an ARC. There were random numbers everywhere and broken lines. I contacted Netgalley and a little bit jokingly asked them if AC releases their ARCs like their games, half finished and full of glitches. It however turned out that it was not easy to solve this problem, but since I really wanted to read it at that time, and my Kobo was still having troubles, I decided to just go with it. And it turned out it wasn't so bad after all. I haven't played the newest game yet, so I can't comment on how much the book follows the game. From what I understood though, the game mainly focusses on the Frye siblings, whereas Henry Green, or The Ghost plays a bigger role in the book. (This was one of the things I really noticed when I read my first AC novel, Renaissance, where literally every little task is translated into the book. Even the stupid get to know the controls ones like carrying crates, very excitement, much wow). I couldn't resist Victorian England in combination with AC. I just couldn't. Even though reading AC books to me really feels like a guilty pleasure. (However less with this book, it felt more like a real story, possibly because I have not yet played the game). I found it highly enjoyable, even though the writing is not the best. The Ghost was an interesting character. I certainly plan to read the rest of the series as snackbooks. In the end it would seem the ARCs are truly like the games. You play/read them anyway even though there are a lot of bugs in there. (Netgalley couldn't fix the problem, and in the end the numbers and other glitches didn't really impact my enjoyment of the book, luckily. Full review to come! I wanted to read my eARC for Underworld, but in my copy the formatting is off. This book was difficult for me to rate because I liked the characters a lot and the story was interesting, but it was written poorly. There was very little detail, and this made it difficult to properly follow what was happening. There were a lot of gaps and jumps in detail and story, and a lot of it felt more like a summary from a bystander than a story about the people experiencing it. I enjoyed the first part of the book with Jayadeep becoming the Ghost and his relationship with Maggie. I wish that she had featured more, as she was an interesting character who had obviously survived a life full of experiences, good and bad. The second part where the Ghost becomes Henry and meets the latest Assassins, Evie and Jacob Frye, children of Ethan, he loses his confidence in his amazing abilities, which is a shame. Mainly because if his father had listened to Ethan at the beginning, He I enjoyed the first part of the book with Jayadeep becoming the Ghost and his relationship with Maggie. I wish that she had featured more, as she was an interesting character who had obviously survived a life full of experiences, good and bad. The second part where the Ghost becomes Henry and meets the latest Assassins, Evie and Jacob Frye, children of Ethan, he loses his confidence in his amazing abilities, which is a shame. Mainly because if his father had listened to Ethan at the beginning, Henry would never have been disgraced. Also Henry does kill, just not in cold blood, not something to be ashamed of and doesn't make him an unworthy Assassin in my view. I really liked Jacob and I wish he had featured more too. Evie makes amateur mistakes throughout, and you would think she would know better. But then I've never been fond of characters that are completely obsessed with something, to the point of being blinkered. finished this and loved it 5 stars. Assassin creed books always pull me in and this was no exception. I feel like I owe Mr. Bowden an apology. I went in with very low expectations, expecting pulp fiction. I didn’t get that. Not at all. I’m actually quite happy to be proven wrong. So, thank you, Mr. Bowden. I’m going to give you a little bit of backstory about me before continuing on with this review. It’s not necessarily needed, but it may help knowing where I’m coming from after I read this. I played Assassin’s Creed: Unity and that’s about it. I don’t recall much of the plot and the characters I feel like I owe Mr. Bowden an apology. I went in with very low expectations, expecting pulp fiction. I didn’t get that. Not at all. I’m actually quite happy to be proven wrong. So, thank you, Mr. Bowden. I played Assassin’s Creed: Unity and that’s about it. I don’t recall much of the plot and the characters didn’t stand out to me. I was an obsessive player and mostly just… well, I still would like to get all the chests and artifacts in Paris one day. That’s the kind of obsessive player I am/was. So, I didn’t have a full knowledge of what the Big Deal Is about Templars and Assassins and why they faced each other, mainly because I didn’t really care. This book… clarified what was going on. And then some. I had no idea it was part of a series (neither did the person who bought it), but it was given to me, so I read it. And this book more than clarified the my vague ideas of “ok, so they’re just two endlessly fighting sides? So what?” and artifacts. It was great. And then—and I have no idea how common this is in the books or video games—the main character had problems with killing people. It was beyond intriguing. It drew me in and made me sit up straight. It added depth. And as I read on, the writing wasn’t half bad. And the characters grew on me, like the best kind of mold. And the plot, while predictable and somewhat straight forward and definitely rushed to wrap up everything at the end, built well(view spoiler)[ and there was an actual traitor (hide spoiler)]. It was the best kind of surprise to be so drawn into this book. And it really made me suddenly appreciate the actual plot of the video games. No wonder they’re so popular. I actually might’ve enjoyed this book more emotionally than all the hours I spent playing one of the video games. Of all the books, of all the series, I wouldn’t have predicted how well it was portrayed that human life is valuable. In a book called assassin’s creed. It was quite a speech. The Ghost let it sink in. Ethan leapt angrily to his feat. “Damn you, man,” he roared, too loudly for the still night. Instead he bit his tongue and turned away from the steam hole to gaze angrily and unseeingly at the false-brick front of the house. There was a catch in his voice, and Ethan softened to see the boy so wrought with despair: a boy brought up to kill for his cause but incapable of doing so. Once again he thought what a sad world, what an obscene state of affairs, when we mourned a man’s inability to kill. To quote Spock: “Fascinating.” I loved how the characters all grew, but also stayed true to themselves. So, an interesting aspect I also found was a passage about how artifacts aren’t necessarily all… powerful? The whole reason both sides are after them is because they’re powerful items from the First Civilization. But both sides have differences in, let’s say, theology. But the pieces they search for, pouring over manuscripts and some losing their lives, sometimes don’t actually do anything. But there’s no way to tell one from another. But they can’t risk the other side being the one to get the Real Deal. And so it’s an eternal race and war to get those artifacts. I’m sure there’s a billion little references I missed. I only caught at least one of them(view spoiler)[—they saw the Jackdaw in one of the rooms—from watching a sibling play Black Flag (hide spoiler)]. I’m very pleased with the results of this book, though. It was well written and some of the dialogue quite clever. It had one twist that I didn’t see coming(view spoiler)[—Ajay should’ve died sooner or committed suicide like Kulpreet and I’m so freaking pissed at him— (hide spoiler)] and left me fuming. Really well done overall. I quite enjoyed it, despite what you may guess from how long it took me to read it. 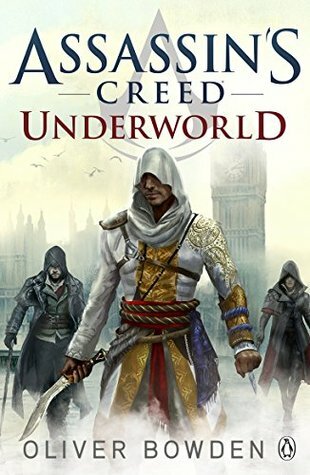 Assassin's Creed: Underworld is the companion novel for Assassin's Creed: Syndicate, the latest (and my favourite) Assassin's Creed game. I guess I'll start off with the big negative with this one that brought it down the two stars, and that's the editing. There is a big problem with repetitiveness- at one point an entire section was repeated, as well as small phrases being used within paragraphs of each other. There were a lot of grammar mistakes and some sentences were written as if they should be longer; the flow was just off, and it did inhibit my enjoyment of the novel quite a lot. I did enjoy the action and fight sequences, and that area really captured the tone of the game. Sometimes it seemed as if things weren't described enough, like one minute a character would be standing on a roof, and the next minute entering a hidden entrance without any solid description of how they’d got there. It was as if the author was relying on us in the second part (Evie’s part) to be familiar with the game, which I am, but might cause problems for anyone who decides to read the book before they play the game. In particular I enjoyed the written dynamic between Evie and Jacob. I feel that some authors struggle to write sibling relationships, especially twins, efficiently, capturing the closeness that comes with it but also the constant annoyance at your sibling, but Bowden really did capture what I loved so much about the twins’ relationship in the game. I do wish the twins' part had been a bit more detailed, but the game is literally about them so I guess I can’t really complain all that much. I also didn't really enjoy reading about the romance between Henry and Evie all that much; I prefer seeing it played out in the game than in writing, but I think that's more of a personal issue I have with a lot of romance sub-plots at the moment. Overall an enjoyable book that did add to my knowledge of the characters, but I did have my problems with it and I don't think I'll pick up any more of the other books as I don't feel like it will help me understand what goes on in the other games that I'm unfamiliar with. I read AC 2, 1, 3, 4, then 8. They're all written by Bowden, and I am disappointed to come to my own conclusion that he had either decided to inject some British flavour (of the no-flavour kind), or he has tired from writing so many AC novels. Where he used to write with such depth as to the environment, he no longer does. Subtle details to draw the reader into the cultural setting, quite none. Where he does attempt to elaborate something, it sounds just like that - an attempt. Plot-wise, the bu I read AC 2, 1, 3, 4, then 8. They're all written by Bowden, and I am disappointed to come to my own conclusion that he had either decided to inject some British flavour (of the no-flavour kind), or he has tired from writing so many AC novels. Where he used to write with such depth as to the environment, he no longer does. Subtle details to draw the reader into the cultural setting, quite none. Where he does attempt to elaborate something, it sounds just like that - an attempt. It was not that I didn't like the book subject, the happenings and stories.. It's just written in a way that just didn't capture me at all. I am a huge Assassin's Creed fan and especially Syndicate which may be my favorite game of all time. It's so interesting to see the back story from some of the characters and because of that it makes a lot more sense the way they act in the game. It also just confirms that I want the imagination of the people who writes these stories and games. It's so impressive how every single story about so many people can connect and still make sense. I am so impressed. If Evie isn't the most inept Assassin, she's very close. Her brother does all the work while she devotes all her time to looking for artifacts she never gets anyway, and she doesn't seem to care at all that in the meantime, people are suffering under the Templars' rule - she's all words, no do, but she scoffs at her brother who actually makes a mark, and accuses him of doing nothing but killing. Funny how throughout the book he's the only one who actually achieves something, all the others - Geo If Evie isn't the most inept Assassin, she's very close. Her brother does all the work while she devotes all her time to looking for artifacts she never gets anyway, and she doesn't seem to care at all that in the meantime, people are suffering under the Templars' rule - she's all words, no do, but she scoffs at her brother who actually makes a mark, and accuses him of doing nothing but killing. Funny how throughout the book he's the only one who actually achieves something, all the others - George, Ethan, Evie and Henry - they just sit around and bemoan their dire situation. For real? 3.5 stars rounded off to 4. I enjoyed three quarters of the book which focused more as a prequel to the game. It was lovely that the author chose to focus on Henry, who remained enigmatic throughout Syndicate. To my dismay, however, the transition from Henry to the Frye twins brought about a major change of pace (although understandable given the circumstance of cramming everything into 400+ pages, I still ruminate on the possibilities) and my only major complaint is that more effort could have b 3.5 stars rounded off to 4. Amazing story, very well put together. Until the last part, where the game supposedly begins... I love the game, but it's a lousy story. Everything before that though, absolutely amazing. Ако си мислите, че играта е тъпа, трябва да прочетете тази книга. След което игричката ще ви се стори като шекспиров театър. Но за феновете на Гей(м) ъв Троунс, както и за всички останали, дето бъркат фентъзи с исторически романи и дето получават множествени оргазми само при споменаване на нещо средновековно, това ще е като чаша греяна ракия по време на сурова русенска зима. After such a great gameplay, this book was disappointing. The emotions fell flat, and the romantic part made me cringe so hard. While enjoy the learning more about Henry Green in the beginning of the book, there were so many holes in the part that were covered in the game. Perhaps it's intentional? OK so I love Assassins Creed. I've played the games, read all the books, am looking forward to the movie. This book however was brilliant. It gave a.backstory to the game that was so interesting and something knew to me. The AC books have always been written as if they are in the same world as the games but from a different perspective, Oliver Bowden has written all the tie in books and has always done a brilliant job. This time however he has excelled himself. This book was outstanding. The writin OK so I love Assassins Creed. I've played the games, read all the books, am looking forward to the movie. The writing was fantastic ~ well written characters, good plots, amazing world building ~ it is all there. The story line is sort of broken in two so even if you haven't played the game you got a summary of what happened. For me I loved the reminder about the story as it's been a while since I played it. The author plays the AC games and you can tell. He is very faithful to what the AC games are all about. Overall I really enjoy the Assassin's Creed books, however this one took an interesting turn. It was all going very nicely until 100 pages from the end when the Frye twins turned up as adults. At this point the detailed explanations that have surrounded events seem to disappear and large periods of time are jumped over. Additionally, conclusions are reached without explanation - one can make assumptions about why they occurred but it leaves the reader feeling unsatisfied. Unlike the first 3/4 of Overall I really enjoy the Assassin's Creed books, however this one took an interesting turn. It was all going very nicely until 100 pages from the end when the Frye twins turned up as adults. At this point the detailed explanations that have surrounded events seem to disappear and large periods of time are jumped over. Additionally, conclusions are reached without explanation - one can make assumptions about why they occurred but it leaves the reader feeling unsatisfied. Unlike the first 3/4 of the novel it feels as though this section was tacked on as a direct line into the game as opposed to being integrated into the plot from the beginning. This is the first book in the series that I have read. The characters and setting really leapt off the pages, and at times I couldn't put the book down. haven't played Syndicate, the game this book is based upon, yet. I'm looking forward to seeing how or if the story lines overlap. The book felt a little long but other than that, it was enjoyable. When I have time I want to read the previous seven. I received a copy of this book from the publisher, via NetGalley, in exchange for a fair and honest This is the first book in the series that I have read. The characters and setting really leapt off the pages, and at times I couldn't put the book down. haven't played Syndicate, the game this book is based upon, yet. I'm looking forward to seeing how or if the story lines overlap. The book felt a little long but other than that, it was enjoyable. When I have time I want to read the previous seven. What I really liked about this book was the historical background, and the facts about the construction of London Underground are really interesting. The Assassins vs Templars theme was boring, inconsistent and mostly unimportant. I think, the more recent the period of history they choose, the duller would be all the chases and secret weapons and stuff... Who would need those, when everyone has a gun? At least, the author of this book failed to answer that. It's a 2.5 not a full 3 mainly because of the last part of the book that was rather rushed. Let's be real, the vault scene was pretty terrible. I liked the first two, the story of the Ghost and Fred Abberline, but I would have liked more focus on the twins. They could have been great, but Evie came out as an obsessive little girl and Jacob appears just a couple of time while he's talking with his sister and nothing more. First two parts of this book? Yeah, pretty good. I enjoyed them. Part 3, I don't know what happened. It was like the editor quit or something. Part 3 read like a draft copy. This would've been good if I'd stopped reading after part 2, but I'm going to assume the content of part 3 had something to do with marketing the game. If so, it really didn't work. This was a really solid book up until the point where it turned into a mediocre retelling of the game. That sounds really negative, but I actually quite liked it. The first two thirds or so really added depth to the character of Henry Green, and built up the events leading to the story in ways that changed my perspective on things and added to my enjoyment of the game. Even the few chapters from younger Evie's perspective were cute and I felt like they complemented and added to her characterizat This was a really solid book up until the point where it turned into a mediocre retelling of the game. That sounds really negative, but I actually quite liked it. The first two thirds or so really added depth to the character of Henry Green, and built up the events leading to the story in ways that changed my perspective on things and added to my enjoyment of the game. Even the few chapters from younger Evie's perspective were cute and I felt like they complemented and added to her characterization in game. Which is what made me so disappointed once the book caught up with the game storyline. I felt like the first parts of the book really lent a lot of insight into the characters and their motivations, but once the story reached the timeline of the game that all disappeared. It was really noticeable that most, if not all, of the dialogue after that point was just copy and pasted from the game script, strung together by pretty basic descriptions of what happens during gameplay. Not to mention the rushed feeling of cramming many many hours of gameplay into less than 100 pages. Multiple characters were simply left out, or merited only a single mention. Even Jacob was heavily sidelined, as Evie was the only one of the twins to have focus chapters. I'd hoped that a novelization which used Evie regularly as a POV character might do a little more with her. Besides (unintentionally?) implying that she had a massive crush on Lucy Thorne. I'm pretty sure that was just a side effect of the fact that most male authors find it physically impossible to describe female characters in a way that doesn't focus on their attractiveness or lack thereof, but hey I'm gonna take it as confirmation that Evie, like her brother, is into people of multiple genders. On the subject of Evie's romantic life, I was also really looking forward to an expansion of Evie and Henry's romance, but again... not much added that wasn't already there. I was a little bit disappointed in this one, I know that from reading the description it was centred on another character in the game, but I think I was hoping for more set during the game itself. I was hoping there would be more of the story from the game, since the Black Flag novel was more so like that. I found it dragged a little, and I got lost a few times with characters and subplots jumping up seemingly out of nowhere. I felt a little disappointed, my favourite parts were ones which the tw I was a little bit disappointed in this one, I know that from reading the description it was centred on another character in the game, but I think I was hoping for more set during the game itself. I felt a little disappointed, my favourite parts were ones which the twins were brought in, for me they were the only interesting characters. Henry seemed a bit dull, his backstory wasn't as interesting as implied. Anton Gill (aka Oliver Bowden) has been a full-time professional writer since 1984, and in the course of the last 27 years he has published 35 books. Gill was born in Ilford, Essex, the son of a German father and an English mother, and grew up in London. He is an acclaimed novelist and Renaissance historian currently living in Paris, France. Bowden has written novelizations of several of the Assas Anton Gill (aka Oliver Bowden) has been a full-time professional writer since 1984, and in the course of the last 27 years he has published 35 books. Gill was born in Ilford, Essex, the son of a German father and an English mother, and grew up in London. He is an acclaimed novelist and Renaissance historian currently living in Paris, France. Bowden has written novelizations of several of the Assassin's Creed console games. Oliver Bowden is a pen-name (a pseudonym adopted by the author) in order to hide his true identity. However, his profession and location are accurate. According to Bowden's interview with UbiWorkshop, he is an avid gamer and gains much of his inspiration for character development throughout the writing process from playing the Assassin's Creed series.